In December 2015, Dallas entrepreneur Matthew Newman held a free lunch for the residents of "Tent City," a homeless camp under I-45 in Dallas. It was shut down in May 2016. The Dallas Commission on Homelessness recently published a 51-page report recommending strategies to tackle the city's significant homeless issue. The city's homeless population has been on the rise -- and homeless camps have popped up around Dallas. 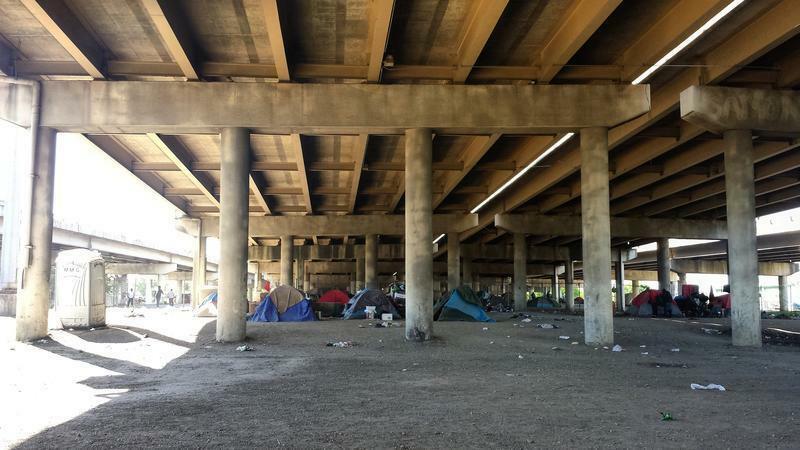 In May, less than a week after officials closed Tent City, a homeless encampment under Interstate 45, Mayor Mike Rawlings and other community leaders created the commission. The 40 members of the ad hoc group were tasked with analyzing the city’s system of addressing homelessness and comparing that with best practices carried out in other cities, specifically Houston, Austin, Salt Lake City, Orlando and Denver. During those six months, the commission came to the following conclusions by holding a series of meetings -- public forums across the city and discussions with people experiencing homelessness -- as well as public surveys and via social media. Based on the 2016 point-in-time (PIT) count, a count of sheltered and unsheltered homeless on a single night last January, 3,810 people experiencing homelessness were identified in Dallas. But, according to the commission, the PIT numbers suggest more than 10,000 people experience homelessness at some point throughout the year. Dallas’ primary intake shelter, The Bridge, reported that 9,147 people were provided shelter services in 2015, according to the commission. 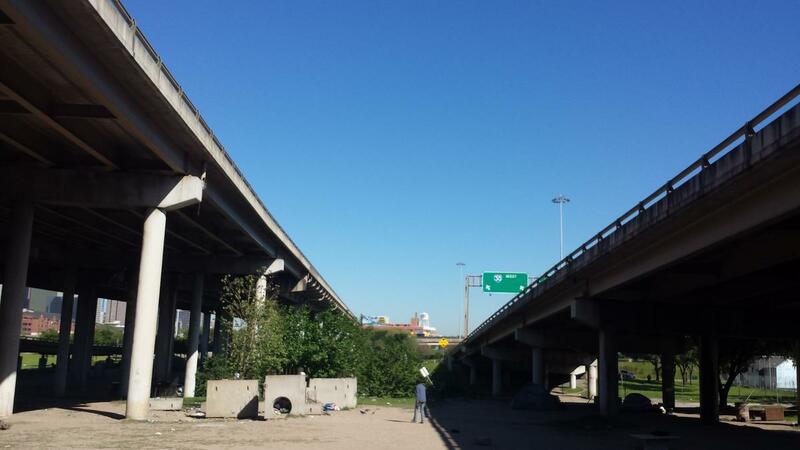 Tent City, a homeless encampment under I-45 that housed hundreds, was shut down in May 2016. Based on the 2016 PIT count, the number of people experiencing homelessness in Dallas County has increased 21 percent over the last year, while national data shows an overall decline, according to the commission. In the 2016 PIT count, 3,810 individuals in Dallas were identified as experiencing homelessness. Homelessness in Dallas exists among subgroups like students and veterans, too. 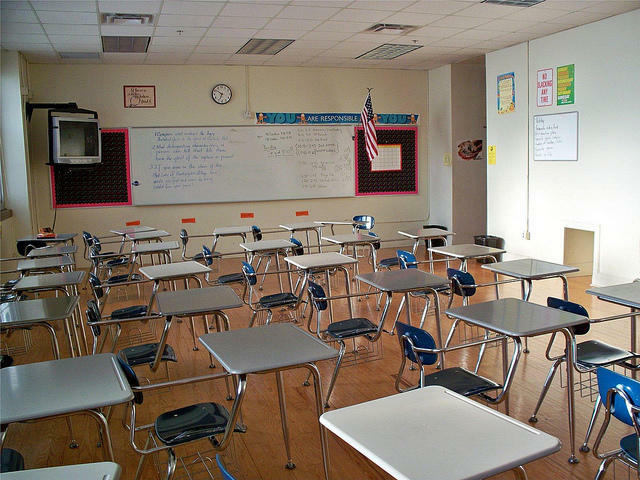 In the Dallas Independent School District, almost 3,700 enrolled students are homeless, according to the commission's report. And homelessness among veterans has increased 24 percent over the last year. Houston and Austin reached “functional zero” for veteran homelessness in June 2015 and August 2016, respectively. The number of veterans experiencing homelessness has dropped nearly 50 percent nationwide since 2010, according to the U.S. Department of Housing and Urban Development. 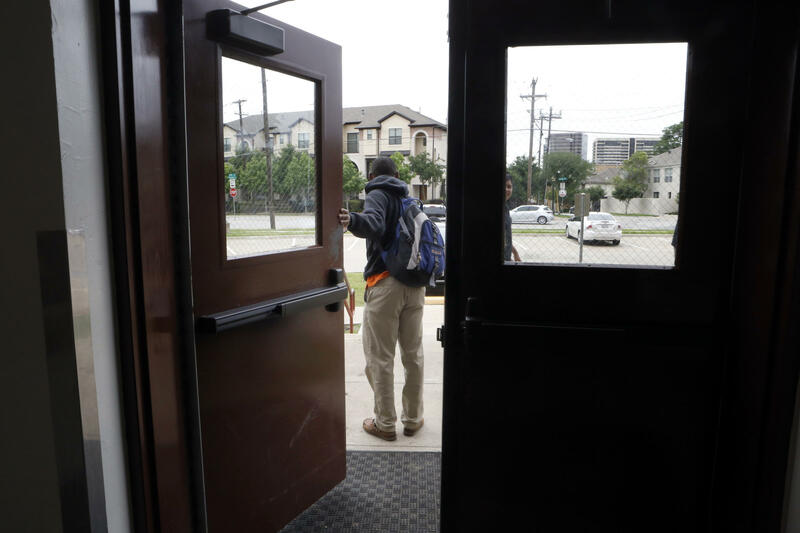 Desmond Davis leaves North Dallas High School after a meeting in 2015. Davis was the subject of KERA's series, "Homeless in High School." The Dallas Commission on Homelessness recommends several strategies to be fully implemented in the next five years but monitored and adjusted each year. These suggestions stem from the underlying issues of homelessness in Dallas: significant economic disparity, lack of affordable housing and need for transitional facilities and resources that help those with mental illness and criminal records. This is the "big picture" recommendation from the Dallas Commission on Homelessness. The city of Dallas and Dallas County should establish a collaborative, community-wide system to address the issue of homelessness. The collaborative system should include overarching leadership, accountability for participating organizations and sustainable funding from federal, state, local and private sources, the report says. The moving parts of the collaborative structure would coordinate community investments, develop comprehensive plans and initiatives and optimize existing resources. Basically, Dallas needs to be better organized with a group to cover any task of operating a wide-scale operation, the commission says. And these moving parts would need to be held accountable for their duties by the system’s leadership. The empty lot under I-45 that was once Tent City, a large homeless encampment in Dallas. This new organizational structure would complement the existing Metro Dallas Homeless Alliance and the Continuum of Care, according to the report. And the new system would need input from citizens to function properly as well, the commission says. Of the 3,810 homeless individuals identified in Dallas, 739 were unsheltered. The commission also recommends more aggressive and persistent street outreach by securing more apartments to be available for the homeless through Permanent Supportive Housing, an effort that doesn't just provide housing, but support services, such as helping find employment and medical care. 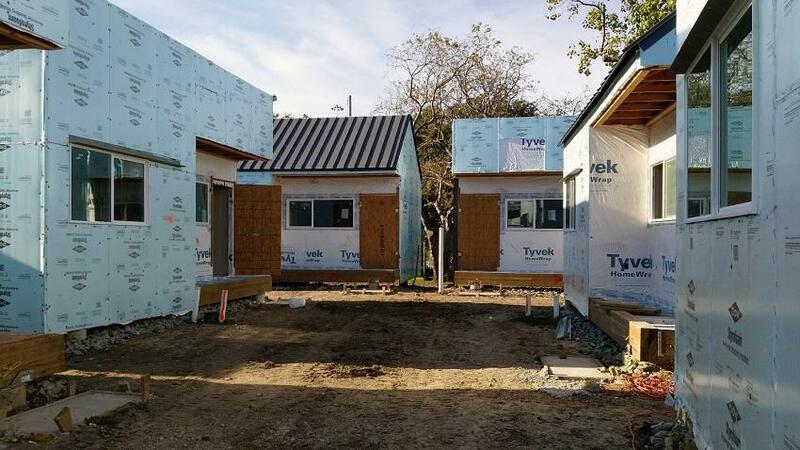 The immediate, short-term goal is to house 600 homeless people, including all veterans. According to the report, state funding has been awarded to four organizations that can see this through. At the time the report was issued, about 75 people had been housed. The first step in implementing this goal would be setting up a Homeless Management Information System to keep track of the needs of homeless clients and the agents that could help them. 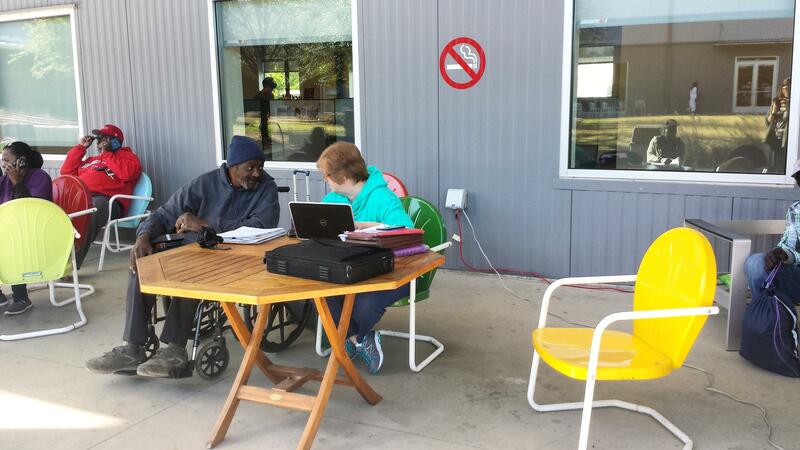 Samuel Patterson works with his caseworker Terri Byrd to find Social Security Income. The commission recommends participation from housing and service organizations, major health providers and criminal justice facilities. The idea is that various services for the homeless would have access to the same information about the homeless population in one place. Of the 3,810 counted, 78 percent were men. Twenty-one percent were women. One percent were transgender. Personal factors, like mental illness and criminal records, can lead to chronic homelessness. They need additional resources, the commission says. The group recommends improving the existing Continuum of Care program, another community-wide commitment to ending homelessness. According to the report, the five largest shelters that provide services to people experiencing homelessness are The Bridge, Austin Street Center, Dallas Life, Union Gospel Mission, and the Salvation Army. These organizations have various rules for shelter residents, from pet policies to rules against alcohol. Still, four of the five reported maximum capacity, the commission says. The Dallas Commission on Homelessness recommends expanding capacity at existing facilities by 150 slots, increasing the number of people transitioning from shelters to housing by 300, and exploring temporary housing options. This strategy also considers expanding day shelters and places for people to go in bad weather. 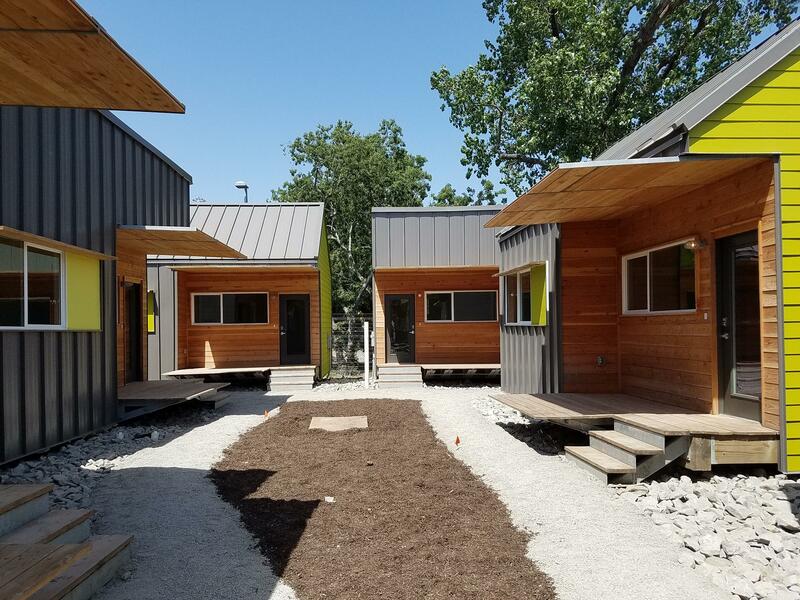 A neighborhood of 50 tiny homes were built for Dallas' most expensive homeless cases. Affordable housing is one of the main underlying issues of homelessness in the city. According to the report, the Dallas Housing Authority made 1,100 housing vouchers worth $8 million available for the homeless population, including veterans. They went unused because of the high market rate and high demand for housing. Meanwhile, more poverty-stricken households are falling into homelessness. A report released in 2016 from the New York University Furman Center measures Dallas’ median gross rent at $950 per month, according to the commission. To many people, that might not sound like a lot. But Dallas has more than 27,300 people who have full-time jobs but are living in poverty, according to a report presented to the City Council in September. About 38 percent of children in Dallas live in poverty — the highest rate among the 10 largest U.S. cities, according to the same report. That percentage means a family of four is living on less than $24,000 a year, The Dallas Morning News reports. In the 2016 PIT count, 1,177 people were individuals in families and 713 were unaccompanied minors. The commission recommends adding at least 1,000 more permanent supportive housing units by 2021. The units would be added by locating existing apartments for rent, creating a master leasing program where a single manager rents out apartment blocks, aligning city development and zoning policies, acquiring and converting existing complexes throughout the county and developing new supportive housing units. The commission notes people experiencing chronic homelessness, many of whom live in encampments, would need additional support from permanent supportive housing or through the process of Rapid Re-Housing. The 50 tiny homes that opened in September, for example, were built to house Dallas’ chronically homeless. The Cottages at Hickory Crossing, located south of Deep Ellum, are designed to house the 50 homeless people deemed the costliest to Dallas County. The commission recommends adding "system navigator" staff to correctional facilities and treatment centers to help in preventing homelessness after clients leave those facilities. Staff would make sure clients have access to medical, mental health, substance abuse and respite care services. Of the 3,810 counted, 55 percent were African-American. Forty-three percent were white. The city should also develop a process to make sure all people entering treatment and correctional facilities are screened for housing stability when they arrive and when they are released, according to the report. And these facilities should have staff members dedicated to finding housing (temporary or permanent) and supportive services for those experiencing homelessness. For more specific objectives that coincide with the five strategies, explore Appendix C of the Dallas Commission on Homelessness’ report below. Read more related coverage on poverty, housing and homelessness from KERA News in the stories below. Every year, volunteers across the country pick a single night at the end of January to count the homeless. A report was released Tuesday about the results in Dallas and Collin counties.